Update: Dec 24, 2014: The Theremini firmware update has been posted for download on Moog's website. 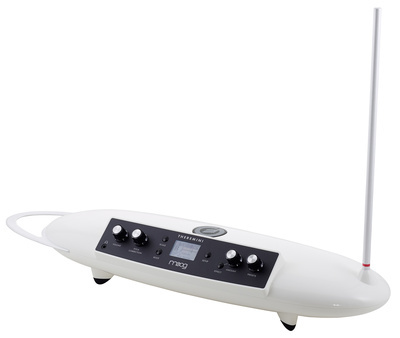 When the Moog Theremini was first introduced at the 2014 NAMM show, it generated quite a bit of buzz (no pun intended). With a new retro-modern space-age look, compact size, digital sound engine, and relatively low price point, the theremin community had plenty to say about the instrument. Our own readers chimed in with their opinions, and the discussion has carried on for months. To address feedback, Moog Music is preparing a new firmware update (v1.1) for the Theremini to be released very soon. We've been testing the firmware update this week, and we think you'll be impressed with the changes. Here's a rundown of what the new firmware brings. One of the great new features in the update is "Theremin Mode", which makes the Theremini behave more like a traditional analog theremin. Normally, the Pitch Correction knob on the Theremin adjusts how much auto-tuning is applied to the pitch antenna. When Theremin Mode is active, however, this knob instead controls the pitch antenna response and the Amount knob controls the master volume. Theremin Mode is buried a bit in the advanced menu options, but it's not the type of setting you'll change often. I suspect most you'll either like Theremin Mode enough to keep it on, or if you never missed it in the first place, you'll never turn it on. 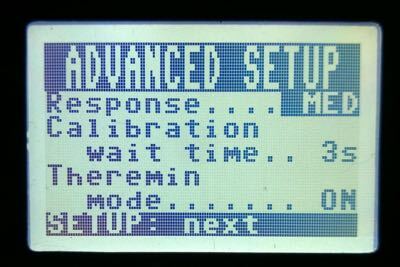 One of the complaints about the original Theremini software was that it had just enough latency to be noticable when trying to perform music. That is, the pitch changes made by the instrument tracked just slightly behind your hand movements in time, making it difficult to quickly and subtly adjust pitch. To many thereminists, this was a deal breaker. The new firmware update makes aa substantial improvement in latency and linearity. I haven't measured latency directly, but after the update, you won't even know it was ever a problem. This uneven spacing made it extra difficult to find individual notes and to build up the muscle memory for jumping from one note to the next when playing in different octaves. The improvements to both latency and linearity make the Theremini a much more playable instrument in my opinion. Version 1.1 introduces a couple of new CV-related features: a new NOTE source that lets you control the pitch of a volt-per-octave CV synthesizer, and the ability to control the offset and scale of any of the 3 CV source types. You can also control the root of the NOTE source. NOTE is now the default CV source type, too. For MIDI, version 1.1 allows you to throttle control message rates, so as not to overwhelm your gear. You can adjust the throttle rate to work best for your setup. Once Moog Music releases the update, you'll be able to download it and manual updates directly from their website. We'll update this article as soon as it's available. Updating the Theremini is relatively easy, but it requires that you have a computer and software that can send MIDI SysEx messages. Luckily, there are numerous freeware apps available for both Mac (e.g. SysEx Librarian) and Windows machines (e.g. MIDI-Ox). You will also need a mini-USB cable to connect it to your computer. The update comes in the form of 2 files. The first erases the old firmware, and the second applies the new firmware. The whole process takes just a couple of minutes. When the update is complete, the Theremini should automatically reboot into the new firmware. You will need to re-calibrate the Theremini after applying the update. Firmware version 1.1 is a must-have for Theremini owners who wish to use it as a musical instrument. It also packs some new MIDI and CV features that will be useful when using it as a synth controller. If you have a Theremini, we highly recommend you download the update.